Fourth of July games are only second to the fireworks this day. The 4th is a time for celebration and good clean fun! 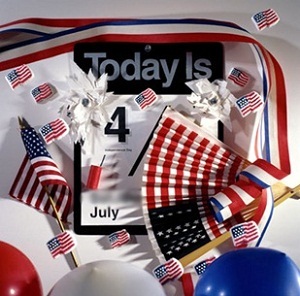 The games listed here were designed especially as Fourth of July games. But there are other sections you might want to consider. Any of the Outdoor Games would be an excellent choice as well. You will find categories there such as Relay Races, Frisbee Games and Picnic Games. One of my favorite outdoor summer games is simply Ladder Ball. If you haven't ever played, now is the summer to begin! For as long as Americans can remember, the nation has celebrated the Fourth of July by staging grand fireworks shows in public squares and lighting smaller displays at home. Why do we commemorate Independence Day by setting off thousands of small explosions? While some historians have suggested that India first invented fireworks, modern fireworks seem to have come to the West by way of China. Most early fireworks were simply repurposed military munitions, fired for entertainment rather than to frighten or kill the enemy. In the 12th century, the Chinese improved the burning fire arrow (a long-established weapon) by affixing small packs of gunpowder to it. From there it was not long before they invented rockets, simply stuffing a container with gunpowder and leaving a hole in one end for propulsion. These “ground-rats” or “fire-rats,” as they were called, were wildly unpredictable, however, and while this made them less effective, it did contribute to their entertainment value. These rockets made their palace hall debut when emperor Li Tsung brought them before the empress Kung Sheng, but when one scurried up to her, she gathered up her skirts and brought the feast to a halt. During the Renaissance, fireworks became popular in Europe and were used in nationalist and imperialist celebrations by figures like Peter the Great and Louis XIV, who were especially big fans of the pyrotechnics. Tradition alone, of course, does not explain the popularity of fireworks here and abroad. As with many festive decorations, including streamers, confetti, festival lights, and balloons, people often appreciate them simply for their bright colors. Others may appreciate the technical ingenuity and the choreography that goes into the show. And others just like dramatic loud noises, the sense of destruction, and the thrill of danger. Over time, fireworks shows can bring back memories of other festive occasions and warm summer nights. On the other hand, there are the occasional fireworks haters. And with that, go out and have fun playing a few or all of these fourth of July games.